Tulum is the site of Mayan ruins of one of the last Mayan cities built before the Spanish invasion in the 16th century. The city of Tulum was also among the last areas to fall to the invasion nearly seven decades after Hernan Cortes arrived in Mexico. The city was originally named “Zama” which means city of Dawn. It was so named because it was located on the sunrise side of the island. The later name of the city, “Tulum”, means “enclosure” in Mayan and referred to the long and thick wall constructed by the Mayans to guard the city against any possible attacks from land. Tulum was among the last cities that the Mayans built. Although it has been claimed that the site was inhabited as early as the 6th century, the city of Tulum itself was founded in 13th century and continued to be inhabited until it was completely abandoned by the end of the 16th century. The city was an important trade centre, being connected to both land and sea trade routes. It had a relatively tiny population of 1000 to 2000 people, still it featured a number of remarkable constructions. One of the unusual features of Tulum was that it had a fortification wall around it, which was rarely ever built by the Mayans around any of their other cities. The city of Tulum was completely abandoned in the 16th century following the Spanish invasion. It was rediscovered in the 19th century and modern exploration of the site began in the 20th century and revealed a number of intact constructions at the site. The architectural features of the constructions in Tulum are similar to those of the buildings at Chichen Itza. Tulum also housed an iconic wall that ringed the island and was meant to protect the city from any invasion from the land. Other notable structures on the island include the El Castillo, The Temple of the Frescoes and The Temple of the Descending God. 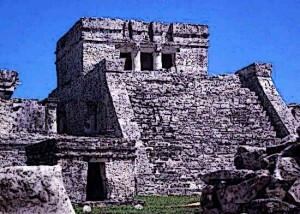 El Castillo is one of the key constructions at the site of Tulum. It is 25 feet tall and researches have surmised that it was probably first built as a shrine that served as a beacon for incoming trade canoes. The shrine was constructed exactly at the spot which was ideal for any canoes coming from the sea to arrive at the island safely. The shrine was later expanded and over the centuries, the entire El Castillo was also built next to it. The Temple of Frescoes is a structure in Tulum that comprises of a lower gallery and another gallery on the upper story. On the outer façade of the temple are found niches with figures of the Mayan diving god. According to archaeological researchers, this temple was used as an observatory by the Mayans to track solar movements. This is a temple located in the central precinct of Tulum. Its name comes from the fact that it has the stucco figure of the Mayan Diving God on one of its walls. The temple also houses a mural. Tulum was a very significant Mayan trading post from 13th to 15th centuries. It was a time when the southern Mayan kingdoms had collapsed and the centre of Mayan civilisation had already shifted to the northern regions and Mayan lowlands. During this time, when cities like Mayapan rose to prominence, small cities like Tulum also came into being. Tulum was a trading post that was connected to both a land route and a sea route. Artifacts on the island reveal that Tulum received visitors from all over Central Mexico as well as Central America, which means that the island was a trade post for many non-Mayan people as well. It has been estimated that the city of Tulum controlled maritime commerce all the way from Honduras to Yucatan during its heyday. One of the major finds from Tulum ruins is the engraved monolith which has been named Tulum Stela 1. Stela 1 is extraordinary in that it has been dated to 564 A.D., which is hundreds of years before the Tulum city was founded. Researchers believe that the stela was brought by the inhabitants of Tulum from another Mayan city. The engraving depicts a Mayan lord and is accompanied by a long writing in hieroglyphs. However, stela 1 was recovered in the 19th century after it had sustained significant damage and a portion of the engraving has faded due to erosion. Among the most remarkable features of the city is its boundary wall which gives Tulum its modern name that means “enclosure”. The wall is a key feature which distinguishes Tulum’s construction from most other cities of the Mayan civilisation. The wall ranges from three to five meters in height and is 8 meters thick. It runs for a length of 170 meters on the land-side of the island, effectively shielding it from any invasions from land. On the seaside, the Tulum city sits above steep cliffs which saved the city from any attack from the seaside. Tulum was one of the last cities that was built by the Mayans. It was a small city located on an island and hosted a small population of 1000 to 1600 people. On the seaside, the city sat above sheer cliffs and was safe from any attack. On the land-side, the Mayans built a huge and formidable wall which ran the length of 170 meters, effectively shielding the island from any land-side attacks. Within the city, Mayans built a number of structures which exist to this day. These include El Castillo, which was probably built after a shrine was established on the island; the Temple of Frescoes, constructed to observe the solar movements and set up with niche figurines of the Mayan diving god; and the Temple of the Diving God, which contains a stucco figure of the Mayan deity on one of its plans. The city rose in 13th century and flourished until the 15th century. It served as a major outpost for maritime trade and controlled a very important maritime route for Central American and Mexican cities.